I think you could probably use more coconut oil than I did, but I was trying to healthify these a bit. You could also sub out the whole wheat flour for all-purpose or pastry. Whatever suits your fancy! Or a lot of chocolate. Note: If you don’t plan on frosting the scones, I recommend adding additional sucanat/other sweetener. I would start by adding an additional 2 T of sucanut, and taste the batter *the perks of eggless baking* to make sure it’s sufficiently sweet. Keep in mind you’ll be adding chocolate chips, though! In a large bowl, sift together the flours, sugar, baking powder, and salt. Cut in the cold, solid coconut oil with a pastry blender or using your fingers until the mixture resembles coarse sand. Add the creamer and mix with your hands until the dough comes together. On a lightly floured surface, shape the dough into a 12-inch circle and cut into 8 triangles. Bake for about 15 minutes, or until the edges just start to turn golden. 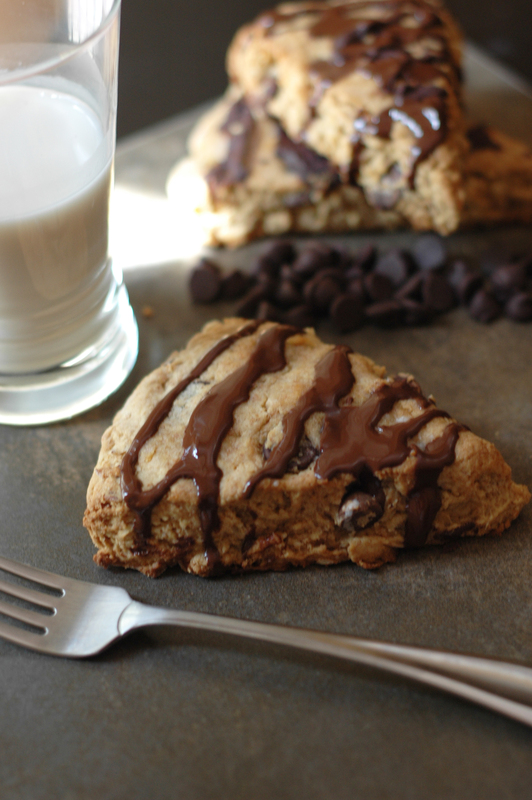 Allow scones to cool completely before drizzling on chocolate. For chocolate frosting, melt an additional 1/2 cup of chocolate chips and a teaspoon of coconut oil in a bowl. (Alternatively, omit the oil and just melt the chocolate chips. Without the oil the frosting will be a bit thicker though.) Pour this into a plastic bag, cut off the tip, and drizzle on. you could always substitute butter if you don’t need them to be vegan! I know! He just thinks he doesn’t like coconut. His issue is more the texture problem. I use coconut pruducts often in my cooking and baking and he always likes it. Trust me if I am making these they will be vegan so I can eat them too! Thanks so much! I’ll take a look at it later when I get home. these scones look great….I’m sure they taste great too! haven’t really tried sucanat before….I’ll have to to try this out! Can you use coconut sugar instead of sucanat? It’s what I have on hand. i think cocount sugar would probably work fine! i’ve never used it before but you can substitute whatever sugar you have on hand. thanks for stopping by! Lovely scone recipe – veganized! The chocolate makes these so awesome! I too am a tea lover, these will be great for my afternoon cup. That’s also the reason you have a blog, hey? Or one of the reasons!